I see what you mean about her being a cliché of a style icon. I feel similar about Marilyn Monroe and Liz Taylor. But I still love them. And all 3 were such wonderful actresses. You look absolutely wonderful. You actually look a bit like Eva Green in these photos. A beautiful shoot and indeed, subject matter Roz. You make several really thoughtful points about Audrey and her iconographic status. I'm typing this, having just glanced up to meet the eyes of the very same Audrey - her face monochrome, her cropped hair and fringe perfectly framing those defined eyebrows, those doe-like eyes. I think this in itself proves your point about her image being so readily available and known that she has lost some of her impact, which is sad but true. All those things you mention that at a certain age it was cool to define your identity with - fairy lights, vw camper vans - well I did that too. And when, like you, I re-decorated my room in cream and raspberry I removed all the posters from my wall - the likes of Audrey and Blondie - yet now my walls are clean and bare again, Audrey is the only one who remains. On a small canvas looking effortlessly beautiful. I remember the first time I saw Breakfast at Tiffany's and loving it. "Moonriver" still makes the hairs on the back of my neck stand up when I hear it. On a musical aside, have you come across the singer-songwriter Kal Lavelle? She plays acoustic guitar and sings in this wonderful, husky Irish lilt and she wrote and recorded a song called "Breakfast at Tiffany's" in reference to Holly Gollightly. If you get a chance have a listen (there are some great tracks on her EP as well). I'm intrigued to know more about Audrey as I've never really researched her story, apart from snippits I've read in magazines when anyone's labelled "an Audrey" like you said. Fabulous pictures. Audrey Hepburn was amazing. I loved her style. She was the definition of elegant. Wow you carried off this outfit so elegantly..sucha classy look! 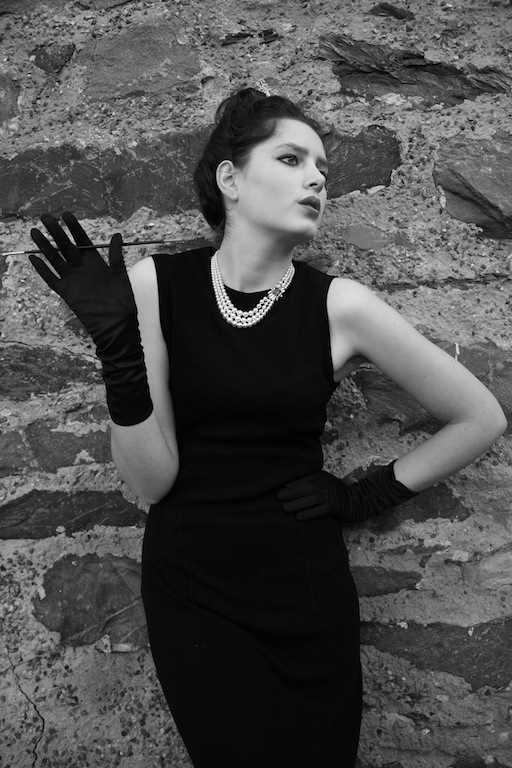 I love your photographic and written homage to Ms. Hepburn. My favourite films of hers are Roman Holiday and the breakfast one, an iconic woman to be sure. The Holly character would have found her clothes vintage as well, I suspect. And your paint brush is an excellent substitute for the cigarette holder. You are stunning. Hepburn is art for me, not a human presence so much as something to be admired for style, grace - and elocution! (I's a laydee I is.) I dislike movies based on her life - they seem tawdry in comparison to the original. Absolutely beautiful shots! Truly wonderful outfit! Love it, love it, love it! I can see what you mean. I was never completely sure of Hepburn myself. Dazzlingly beautiful, yes. An amazing style icon, yes - but as an actress I kind of felt she was missing something. This was until I watched 'Wait Until Dark'. All time favorite film (Next to Rebel Without A Cause - but you know that, haha!) The acting from everyone was fantastic. I think that maybe I liked Hepburn in it so much because she pushed away her girly side. Either way- brilliant movie, brilliant actress! What a beautiful photo shoot and a great tribute to Audrey. Icons can't help but become cliches I guess, but something about Hepburn and Monroe's charismatic images resonate with so many of us. I have you rather than Audrey any time. Much love and admiration, my dear Rosalind. The original gamine and ingenue. LOVE her. I get what you're saying when the cliche of icon and fashion inspiration gets thrown her way- but I'm still in love with Audrey- the woman, the actress and the natural stylist. She tore my world up and made it possible for me to enter the realm of style- her girlish gamine ways, her artful airs and her classic yet quirky (at the time) style. I've watched all her movies, read a few biographies and sat through a dreadful bio-pic for my love of her. I want this book- it looks like a wonderful momento of this graceful lady who marked so many of us. It's a tad annoying that she's generally remember just for one character and look - but as this book surely shows is just how versatile, quirky and down right gorgeous she was. And very talented too..... damn it! These photos, wow, just wow...I can't even focus on the words you've written. Goodness me, you look so sleek and elegant! You have truly recreated the class and fabulousness of Audrey! So commendable! Came across your blog and your blog is definitely one that I'm following right now! I really love your writing style and how you incorporate it with beautiful pictures of fashion. Really inspiring! Lovely post and thoughtful writing that allows me to appreciate the glimpse of an icon, with the crust of overexposure peeled away a little bit. Your interpretation of her is lovely as well, although you feel more serious, whereas she feels somber in her coquettishness. The fashion really is inspiring. I've never seen a striped, sporty dress look so good. Wonderfully captured Roz! I adore the interpretation, especially the last stunning photo. Wait Until Dark is a good suspenseful classic ... I remember when I first saw it pleasantly surprised how much I loved it. You're a beautiful and innocent Holly Golightly! I love your 3-strand pearls and that starburst on your top knot. Idolizing Audrey seems to be a rite of passage for most girls who aspire towards chic elegance. As a young lady in my 20s, (particularly living in Manhattan then) Audrey was the epitome of living like a young sophisticate! I remember hosting a Halloween party back then, and -- predictably falling into that cliché you discuss here -- I was dressed up very much like you in this shoot! I wish I could have been as imaginative as you in pulling out a paint brush for lack of a cigarette holder. At least that would have been a bit creative.